When George Barnes was 17 he was hired by NBC for their WLS Chicago affiliate and became the youngest conductor and arranger in the network’s history. When I was 17 George Barnes died of a sudden heart attack. He was 56. That same year I discovered a double-album at the local Public Library called The Guitar Album, featuring a list of names I had never heard of. It turned out to be from a 1971 concert of Jazz guitarists at Town Hall in New York City. Being a rock fan, there was very little of interest on it for me. Then, I heard the duets of George Barnes and Bucky Pizzarelli. I was enthralled with the musicality of the tunes, the breathtaking licks, the slower passages of glistening, liquid tone. For some reason I assumed the suave, James Bond looking guy with the colorful name must have been doing all the exquisite lead playing. Only later did I realize it was the squat, cigar-chomping George Barnes who was tripping the light fandango in such a transcendent manner. He had a lot of practice, as it turned out. It is believed that Barnes was the first person to play an amplified guitar, wired up by his brother when George was 10 years old. He joined the Musicians Union at age 12 and at 16 he became the first person to record with an electric guitar, on a March 1, 1938 waxing of two Big Bill Broonzy performances. A master of touch and tone, Barnes could play any style required as a hired gun. He spent his adolescence recording with the top Chicago bluesmen and playing on NBC’s popular show, National Barn Dance, where he pioneered the sound that was copied later by many Country and Western guitarists and earned his place in the Rockabilly Hall of Fame. While he always enjoyed playing country music, his true forte is a mixture of whimsical Swing and elegant Jazz, which retain their bluesy roots but are a far cry from the Grand Ole Opry. Drafted in 1942, his trained ear allowed him to become the first person among half a million candidates to get a perfect score on the Army’s speed code test. He spent the remainder of the war in the basement of the Pentagon, transcribing enemy code. The octet’s “Standard Transcriptions” was once a hard-to-find collectable record, but it can now be downloaded for less than $10 at Amazon.com. Decca Records’ Milt Gabler heard Barnes on the radio and signed him to a comprehensive recording contract. In May 1951 he moved to New York City, the recording capital of the world at that time. There he began to make his solo recordings, as well as appearing on countless other records as a studio top gun. 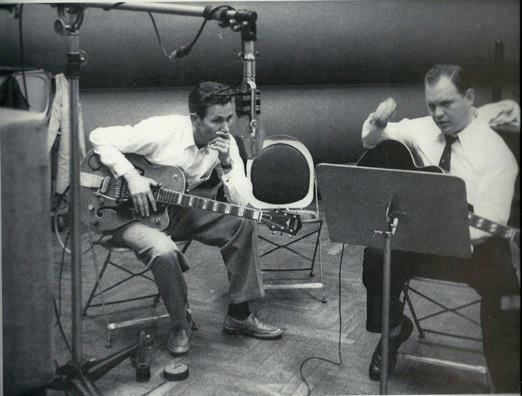 Les Paul, Charlie Christian, Merle Travis, Herb Ellis and Chet Atkins have all cited Barnes as a major influence. 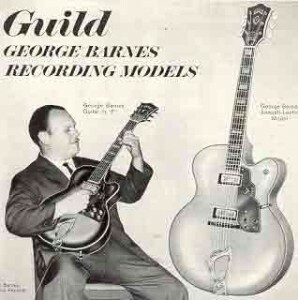 George Barnes played on more recording dates for more people than any musician in the union’s files. He appeared on some 100 Blues records in the 1930s alone and the 1950s found him on another 100 albums of everyone from Frank Sinatra to Louis Armstrong to Homer & Jethro. He was even the first person to play an electric guitar on a Bob Dylan recording (the unreleased 1962 track, Mixed-Up Confusion) and he played bass on the album The Freewheelin’ Bob Dylan. However, Barnes was never content strumming in the typical rhythm section that permeated popular music, so he continued to forge a career as a featured soloist, leading combos of various sizes. Still, he remains unknown to many and only recently has some of his best music made it into the digital world. For the most part, Barnes played Gibson guitars throughout the 1940s and 1950s. That was all to change in 1960. So, Guild built him the small guitar with the extra-short scale that achieved notes five steps above a normal guitar. Barnes made two LPs with it for a series on the Mercury label that demonstrated their new “High-Fidelity” technology. Only a handful were made, now among the most collectable electric guitars. Guild also built him the full-size signature model. Based on their largest archtop model, but it had no F-holes, which Barnes believed were the major source of feedback issues. Instead, the acoustic ports are placed around the pickups. With a back and top hand carved by master luthier Carlo Greco, the Guild George Barnes Acousti-Lectric model was an exceptional example of guitar making. They remain highly sought after. But fewer than 20 were ever made. A pity. Barnes was left-handed, but played a right-handed guitar. He felt the work at the fretboard should have the advantage of the strongest hand. He also played with the heaviest strings he could get, and the thickest picks, which he said were essential for good tone. He always picked or strummed with a downward motion, which is pretty amazing when you hear his rhythm work and the amount of notes he was able to produce when playing fills and lead guitar. It is said Barnes had originally wanted to be a horn player, and his approach to melody and arranging retained that sensibility. He was best known for single-note melody lines that related closely to the actual tune being played, and a style of trilling that he learned from watching violinists, where he would begin with relatively slow hammer-ons and then increase the speed and attack as the sympathetic harmonics started to bloom. But no matter how jazzy the music, he often found ways to incorporate string bends and bluesy licks that would start in one position and glide up to resolve at the next octave with a flourish of vibrato. George Barnes was considered a cutting-edge progressive when he first appeared on the music scene. He was often the only white person at the Chicago Blues recording sessions he frequented as a teenager, and for some years even established music journalists assumed he was black. He experimented with the earliest multi-track recording techniques, and continued to try out new technologies. In his later years, he made a point of performing arrangements of contemporary popular selections, but he remained dedicated to the music of pre-Bebop composers like Louis Armstrong and Duke Ellington. He felt that the Jazz community would pay lip service to their legacy, but never actually played their music. He became an elder statesman of Swing well into the era of Rock n Roll. 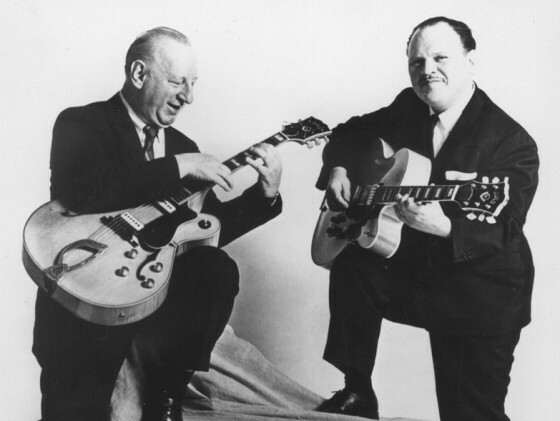 His close friendship and good-natured rivalry with Les Paul continued throughout the Fifties and Sixties, and they recorded Les Paul Now! together in 1967-68, while living under one roof for 8 months. Les would play one lead track, while George played everything else. 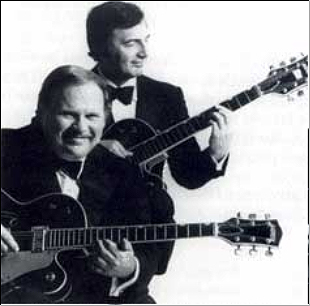 Barnes spent most of the Sixties recording and performing with various top-shelf partners, including guitarist Carl Kress, pianist Ralph Sutton, and violinist Joe Venuti. In 1970 Bucky Pizzarelli brought his new 7-string guitar to Barnes’ studio to see how it sounded on tape. Their jamming led to a year of performances including the Town Hall concert of Jazz guitarists aimed at showing “young people” that the guitar had been around before the Beatles. This was the recording that introduced me to Barnes in the first place. Afterwards, they made several recordings, including some with Tony Bennett, whom they also backed up on some live gigs before they hit the road. 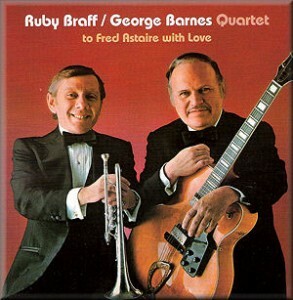 The volatile marriage of Braff’s in-the-moment improvisations and Barnes’ meticulous arrangements sparked a chemical reaction that gave birth to the darling of every club and Jazz festival they played in the U.S. and abroad. They divorced after three years due to irreconcilable differences. Barnes and his wife Evelyn moved to California 1975, where he put together the George Barnes Quartet. After two decades playing with partners from whom he eventually split over finicky artistic differences, he finally took center stage all by himself. There, he generously featured his band members, but no one forgot who was the star of the show. Featuring Benny Barth on drums, Duncan James on guitar, and veteran bassist Dean Reilly who felt Barnes’ love of classical string quartets greatly influenced the proceedings, they rehearsed for a year, with all four musicians playing specific parts of intricate arrangements written by Barnes, which had to be memorized – no music stands allowed on stage. They performed much like a chamber orchestra, but with room to stretch out during solos and the freedom to respond to what was going on in the ensemble at any given moment. No one could have guessed it would all soon be over. 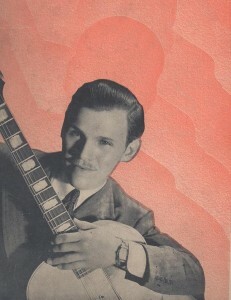 Countless musicians across many types of music have been influenced by the man with the big blonde guitar. Even if they had never heard his name, the amount of blues, rock n roll, folk, country, and jazz recordings he had a hand in would fill a large catalog. Many young guitarists playing today were inspired by guitarists who were inspired by other guitarists who were directly inspired by George Barnes. Fortunately for us, there are some excellent George Barnes recordings now available. I could recommend many. 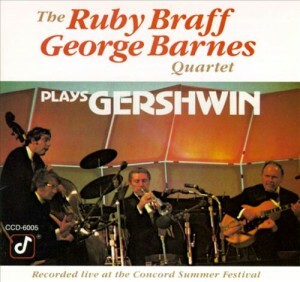 But I will start at the end, as there were two superb live performances of the George Barnes Quartet captured on tape and eventually made available on CD. One of them, George Barnes Plays So Good, provides an intimate hearing of a late set at a small club in San Francisco. But if you only buy one George Barnes record, let it be Don’t Get Around Much Anymore, which contains the entire concert at the Willows Theater, Concord, California on July 27, 1977. It was his last public performance, and it is a doozy. David Grisman originally put it out for release, after the engineer who recorded it gave him a listen. And now, just this year, they are offering a download of the entire concert in super Hi-Def audio. Should you come to know the record well, I believe you will appreciate it as much as I do for the sheer joy which exudes from the performance captured therein and for the masterful way George Barnes wrings, tickles and caresses such melodious tones from his guitar. Even if black tie Jazz isn’t your scene, the sheer excellence in the musicianship is sure to win you over. But, at times, you may think you are about to make an entrance on a 70s talk show, due to the genre of music. Somewhat ironic, since Bucky Pizzarelli was the guitarist in the orchestra on NBC’s Tonight Show. A very warm thank you to Evelyn Barnes and Alexandra Barnes Leh for corrections and extra details! Please support their newly launched George Barnes Legacy Collection! Here is one of the two sides cut on March 1, 1938, featuring an electric guitar on a commercial recording for the first time in history, played by George Barnes. With a record price, the guitar that changed American music, Dylan’s Strat from Newport ’65, sets another milestone. When Bob Dylan ripped into “Maggie’s Farm” in front of a stunned crowd at the 1965 Newport Folk Festival, not many people realized they were seeing a paradigm shift in the current of popular culture that would reverberate around the globe for decades to come. Fewer still would have guessed that the Fender Stratocaster with the sunburst finish strapped around the lanky 24 year old that evening would later be sold for just shy of $1 Million Dollars. But that is exactly what happened today at Christie’s in New York City, as the 1964 guitar used by Dylan to officially “go electric” sold for a record $965,000 to an anonymous bidder, almost doubling the top estimate of $500,000. Serial number L31324, and sporting a neck date of 2 May 1964, this alder body, maple neck, Brazilian rosewood fingerboard guitar was used during sessions of Bringing It All Back Home, and possibly some sessions for Blonde on Blonde, as well as the infamous electric set at Newport. Sometime after the historic gig, the guitar was reputedly left behind on a private airplane and taken into possession by the pilot, who claims to have made attempts to return it. After almost half a century, in 2012, the PBS television program History Detectives were able to match the wood grain on the top of the guitar with a close-up photograph of Dylan on stage at the concert. Originally Dylan’s attorney claimed the artist was still in possession of the fabled guitar, but after an undisclosed settlement between Dylan and the pilot’s family, the sale went ahead, and garnered a price beyond all expectation. I remember vividly the first time I saw the black and white footage of the performance. While wild and a bit distorted, it is hard to believe that Dylan decided to go electric only the day before (after having performed three acoustic tunes at the “workshop” portion of the festival, but taking offense at the way festival officials spoke negatively about Paul Butterfield’s use of electric instruments.) With Mike Bloomfield on guitar, Jerome Arnold on bass, Same Ley on drums, and Al Kooper on organ, it is easy to see how electric the performance actually was, and how a great many people responded to the raw energy in a favorably manner, despite any actual booing that took place. While some people claim the booing was in response to the brevity of the three-song set, Dylan felt otherwise. In any case, “Maggie’s Farm”, from the electric side of the just-released Bringing it All Back Home, the single “Like a Rolling Stone”, which appeared a week or so before, and “It Takes a Lot to Laugh (It Takes a Train to Cry)”, then called “Phantom Engineer,” soon to show up on Highway 61 Revisited, made clear the direction Bob Dylan and progressive American music would be taking. And the three tunes were played at Newport on the guitar sold today, for a fraction of what Dylan has earned playing many other Strats through the years. We may find out eventually. George Barnes just may be the best guitarist you (thought) you never heard. He appeared at more recording sessions than any musician in the union files – blues, jazz, rock n roll, folk, country and western, you name it.